Artbox is based in a spectacular rural setting at The House on The Hill in Chediston, Suffolk. The studio, gallery and framing workshop are housed in converted farm buildings within moated grounds with a treehouse, roped walkways and outside seating for summer lunches. The gallery displays work by the Artboxers as well as exhibitions by other artists and offers refreshments to visitors. We also host fundraising events such as quiz nights and cream tea afternoons (see 'What's On'). The Studio is fully equiped and all art materials for sessions are supplied by Artbox. The Framing Studio offers a wide range of services which helps raise funds for equipment and materials. 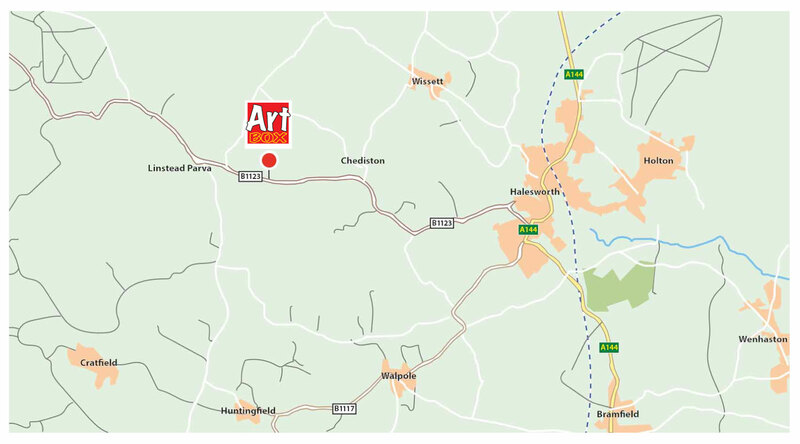 Artbox is easily located west of the market town of Halesworth. From Halesworth take the B1123 signposted Harleston and Metfield, contine on the B1123 through Chediston and on leaving Chediston the gallery will be found on your right hand side. From Metfield follow the B1123 signposted Halesworth and the gallery will be found on your left just before you enter Chediston.